Across the northeast, November of 2006 was turning out to be stormy and rainy. And rainy and stormy. And stormy and rainy. Since our last hike in the Catskills in early November, the weather had descended into an endless stream of gray, misty, rainy days. A huge rainstorm and very warm temperatures then drenched most of the northeast. And then, the weather predicted a lone, nice day on Saturday, November 18. Well... who knows when that's going to be repeated, hm? Time to go hiking! I decided to continue this year's trend of knocking off as-yet-unclimbed 4000-footers. 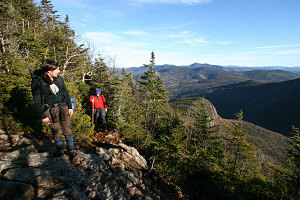 On this rare nice November weekend, we would climb the Osceolas : two 4000-footer peaks in the southern reaches of the White Mountains of New Hampshire. 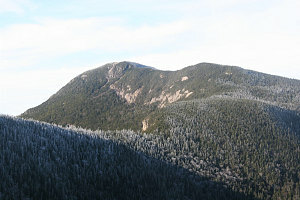 And, if things went well, we'd try and get a third peak, Mount Tecumseh, in on the same hike. Ewart, still newly awakened from his hiking slumber as a result of the end of the gardening season, was keen to join us. 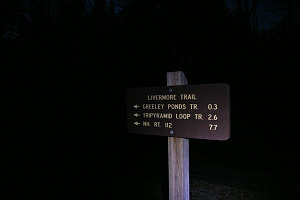 His suggestion was a long loop hike, starting and ending at the Livermore trailhead. 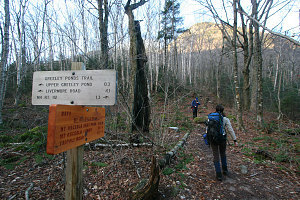 The Livermore trailhead is situated at the head of Waterville valley, a ski resort area in the southern White Mountains of NH. 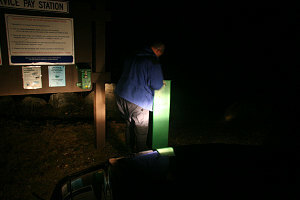 Knowing this would be an arduous hike, we drove down early enough so that we could get to bed early and up early. 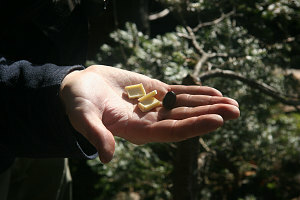 We camped along a forest road (Tripoli road) not far from our trailhead. 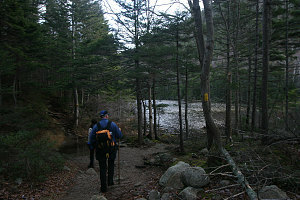 It was quite warm for this time of year - a good sign for those wanting to avoid ice-covered trails! 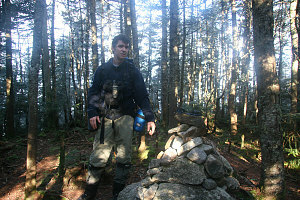 The next morning, we were up at 4:30am, and at the trailhead and ready to hike shortly after 5:30. 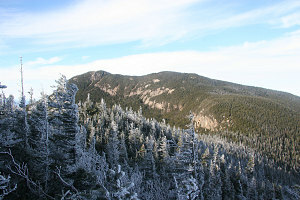 It was clear and not that cold - conditions were looking favourable for good views and non-icy trails. Our route was counterclockwise. 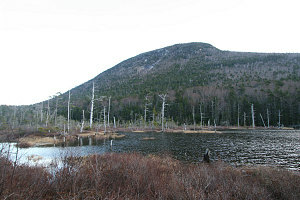 We headed up the Greeley Ponds trail, over very gentle terrain, towards Mad River Notch. 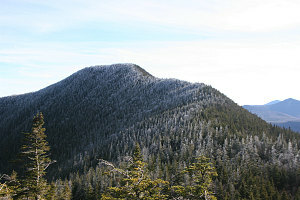 Mad River Notch is a pass in the east-west range of mountains just to the north of us, of which the Osceolas were a part. 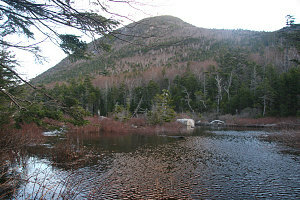 A couple of scenic ponds (called the Greeley Ponds) are nestled in the height of land in the notch. 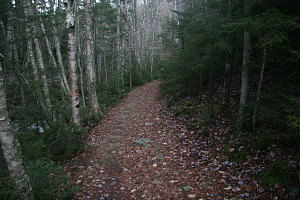 A gentle and wide trail was perfect for nighttime hiking: we could cover a lot of ground easily in the dark, and then, by the time the route got steeper, it would be light. 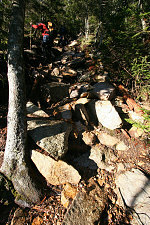 The trail was very wet from recent rains, and the surrounding streams were very swollen. 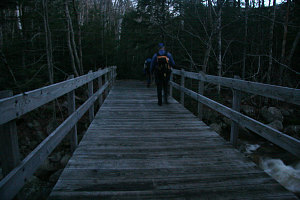 Fortunately for us, almost all of the stream crossings were bridged with good and wide cross-country ski bridges. 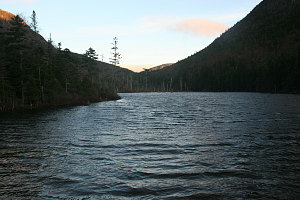 We arrived at the Greeley ponds just after sunrise. There was still no sign of any sort of snow or ice, and looking at the peaks around us, it looked pretty snow and ice free up above, too. The previous weeks' mild weather and rain seemed to have washed all of that away. 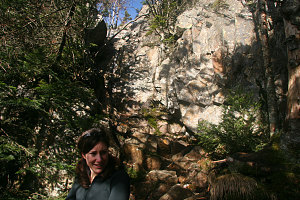 We reached the Osceola trail just after the height of land in Mad River Notch. 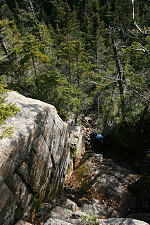 Above, we could see many high and interesting cliffs, and we knew that the trail would be gaining some serious altitude quickly. 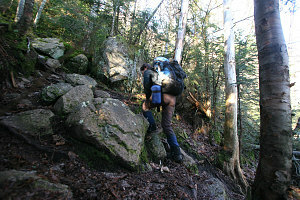 The Osceola trail started off north and northwest, and quickly became very steep. 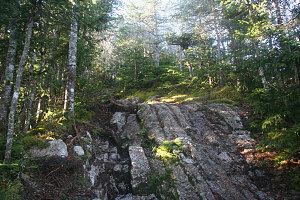 Early in the morning, fresh with energy, a good steep climb is a fun way to quickly gain elevation. 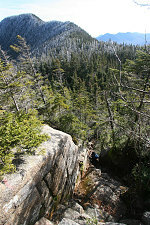 Soon we ascended out of the shady notch into sunlit slopes; higher up, the trail climbs very steeply up rocky terrain, and at one point crosses a bit of open rockslide. Excellent views to be had here! 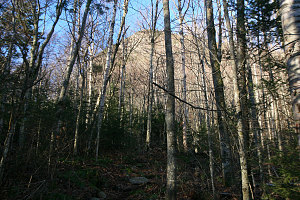 Not far above the small open slide, the trail suddenly crests the ridge of East Osceola. 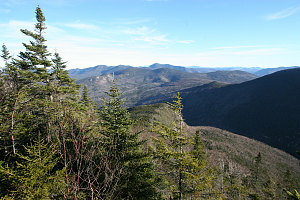 To the right is a good limited view of East Osceola and Main Osceola. 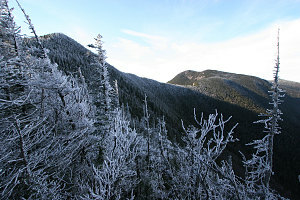 There was a coating of frost on the trees here, but otherwise, still no snow or ice. Rare to have such conditions so late into the year! 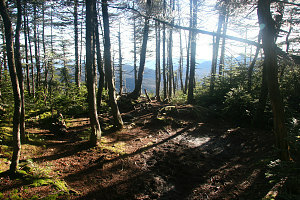 Now continuing at a much more moderate grade, we followed the pleasant ridgecrest trail to the summit of East Osceola. 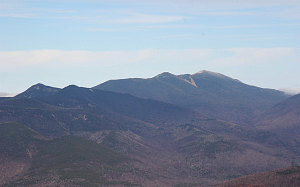 For some reason, I had the impression that East Osceola had an open view from its summit. It does not! 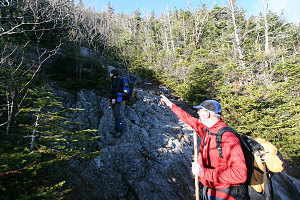 Ewart assures me that better views lie ahead, so we do our 'bergheils' and continue on, reaching the low point on the ridge between East and Main Osceola. 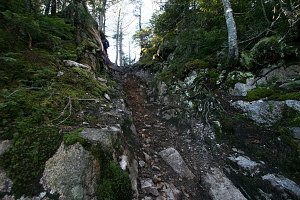 Here, the trail encounters a steep step that requires a bit of scrambling. 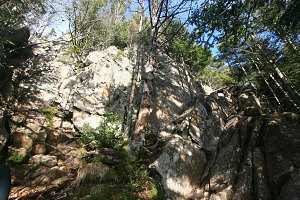 There is a fun and nearly vertical chimney that the trail climbs (which is quite easy and has excellent incut holds) that is climbed (and there is an easier and more circuitous scramble as an alternative - but I say do the chimney, it's fun!! ).